A new single was just released call "Unknowable" on Bandcamp. Last edited by billandrewsjr; 11-14-2018 at 09:08 PM. Nice to hear (very fine) new music from Steve K! Sounds great! Do you think an album is coming? Apparently an album is in the works! Though Steve has said these two tracks won't be on it I think. "I Cries Crimes" is seriously up there with my very favourite Rascal Reporters tunes. So excited to hear more. I feel quite lucky to be getting more RR! Tried to post this review on the Bandcamp page but it was too long, so I'll post it here? Unknowable is a fantastic journey. Bits and pieces of the tune jump out here and there with synchronicity, before diving back into a collage of synths, guitars and drums. The drums push in one direction, and then the guitar becomes the focus and leads you down another, until the synths then reassert themselves and take charge again, culminating in a section near the end where all the instruments turn to the same page for a moment before collapsing into a chaotic outro that sounds like it could go on into another groove/section after the fade. Rascal Reporters at its most boundary pushing. I Cries Crimes is a very exciting tune - a touch of modern jazz, soft bass & guitar playing & saxophone, with subversive drumming and some classic sounding RR chord progressions and melodies. This one is actually probably one of the "vibiest" Rascal Reporters tunes I've heard, and I think it's absolutely fantastic Steve is making music of this caliber today and is still forging new paths. The chords and melody on this one feel really 'deep' and 'golden'. Favourite tune from the release here. Last edited by auxfnx; 11-22-2018 at 07:12 AM. What a great review! I could not agree more. I hope this proves to all the Progressive Ears followers that Steve Kretzmer is back! Like all prog musicians, I hope the community supports Steve by buying the single; it's only $2! In the meantime he is working on a brand new album!!! Unknowable is an interesting journey. Bits and pieces of the tune jump out here and there with synchronicity, before diving back into a collage of synths, guitars and drums. One moment the drums are leading you in one direction, and then the guitar becomes the focus and leads you down another, until the synths then reassert themselves and take charge again. It feels like the track gets more and more cohesive as it goes along, culminating in a section near the end where all the instruments turn to the same page for a moment before collapsing into a chaotic outro that sounds like it could go on into another groove/section after the fade. Rascal Reporters at its least compromising. Been getting into The Foul Tempered Clavier more and more over the past week. What a lovely review. These were fun tracks to work with Steve on - and it is very cool to have new music from him. I agree that these are quite Rascal Reporter-y tracks too. Dr. Gore would be pleased also. Last edited by Polypet; 01-10-2019 at 06:06 PM. After a bit of distance from this and then cranking it up on my system here for a spin, i can honestly proclaim "What an exciting and unusual set!". Especially the first is a fine example of the melding of minds Steve and i were able to achieve. What a treat to be able to work with him. The first track on this release is really something else. At first it seemed so entangled (and unknowable haha), but it keeps me coming back. Every listen I catch something new and understand the song a bit more, it so super dense and there's so much to figure out I love it. Too much to say, starting with Steve's original tracks, Dario's synth tracks - the song's lovely but surreal structure and a live remix of tracks on my part adding bass, drums and other nonsense to the overall abstraction. Dario and Steve are both brilliant. A lot of unusual things in the overall mix. In my live remix, bits of the track pop out in slow motion or re-pitched to give itself a rhythm or harmony; tracks are realigned against themselves; there's bass, guitar and percussion stuff; all sorts of trickery to generate a proper rock atmosphere in the surreal background. I was thinking Captain Beefheart when i first heard his tracks. And the way i realised it was using a little live DJ-style remixing and tape work. But really there is a lot more in that thing - too much studio magic to break fully down. We all got very cool tracks from each other as they progressed. In this case, i was able to work with the finished tracks from everyone else and Steve gave me free rein. As Steve says, it's a wild psychodelic trip. A real mix of old school Rascal Reporters and Polyethylene Pet (my own thing). I thought it would be too twisted a take for him but, as i should have known, he loved it immediately and had more ideas which took it exactly where it needed to go. Playing drums with his music is always a treat. As with Mike "Mad Dog" Johnson, he has a sick sense of what is supposed to be "rock music". He simply said - do the bass and drums and whatever else you want. Make it "rock out". Mike says that too. Thankfully, i have the same rhythm issues. As Steve Gore used to say, i too am a "rhythm scientist". So there ya go. I hope more people do check it out. Steve would very much appreciate it, i'm sure. And any shout outs about the release to friends and foes. Last edited by Polypet; 01-28-2019 at 07:37 PM. Love this breakdown, thank you! Looking forward to working on some of the new tunes myself so great to hear your insight! I'm currently giving this same treatment to a few different tunes, including an old pop song 'Her Kind' and a 13-minute epic 'Hubert Greenery Peck' which is the most intricate and non-repetitive song I've ever played on, and a total Rascal Reporters masterpiece that never saw the light of day, considered by Steve Gore to be Kretzmer's masterpiece! The drums and bass are fabulous. Well done mate. I keep pushing the various singles and all of it really - I wanna hear a new album.. .and the latest is great. Hope it all keeps moving in the right direction! You legend <3 ty ty ty!! I LOVE Unknowable / I Cries Crimes, and I can say that because I wasn't at all involved!! I really really want to hear a new album too so you can bet I am driven! 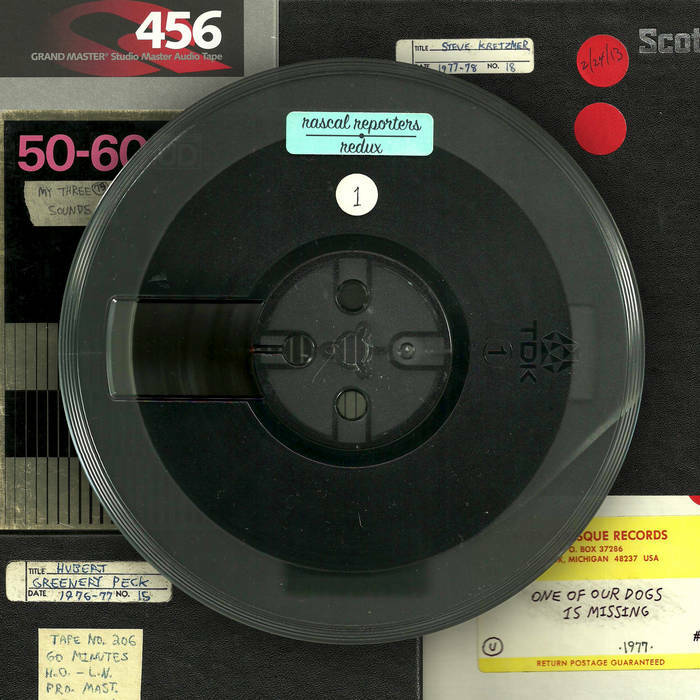 While Rascal Reporters are known for making and releasing complex music, there nonetheless remained many pieces in the archives - mainly pieces written by Steve Kretzmer in the mid to late 70s - that were considered too complex to overdub with the resources available and the restrictions of recording equipment at the time. And so, while they felt these songs were some of their finest compositions, they were never completed. With the 'Redux' series, these songs are finally coming to light, being fully produced, remixed and overdubbed with additional drums, bass, guitar and keyboards by new Reporters member James Strain, almost like a baptism by fire. This includes all 14 minutes of "Hubert Greenery Peck", the ever undulating "One Of Our Dogs Is Missing", a psyched out Steve Gore synth jazz rock piece from the 80s "Egos Explode" and even a pop song with vocals by Kretzmer, "Her Kind". A second volume in this series is already being prepared, with many more fully composed pieces in the archives waiting for a full production treatment, and is planned to follow the forthcoming Rascal Reporters full length studio album, "The Strange Case Of Steve". hey now! this is great stuff! It is fabulous, fellas. Stevie K is building up a nice set of releases this past couple of years, the Unknowable single and now this fine EP. I'm so digging hearing new Rascal music with Mr. Stain's excellent enhancement and assists. Just beautiful. I could feel Steve Gore's presence and blessing over the project also. His tune Egos Explode is a highlight. It all is right at home among their other releases. "So, i guess that's what's in now with the kids." Great job - highly recommended. Last edited by Polypet; 1 Week Ago at 12:03 PM. Bought. Really pleasant stuff (I am reminded of Muffins in a way).